Anaerobic Co-Digestion, as described here, is a successful Municipal Solid Waste Management strategy where anaerobic digestion is directly integrated with (aerobic) composting in one waste facility. The portion of the municipal solid waste (MSW) in developed economies, which is organic in nature, and derived from household, industry, gardens, public parks and the treatment of waste wood, has been commonly determined to comprise between 40% and 60% of the total by weight. The proportion is also expected to rise over the next few years, as increased recycling rates are achieved for man made re-useable materials. Therefore, as countries put in place sophisticated waste processing techniques to reduce the amount of waste generated, and then still wish to reduce the use of landfill still further, the degree of mass reduction, the manner in which this organic fraction is processed and the amount of readily useable and non-renewable energy (replacement fuel) produced by these processes is becoming of greater importance. Two processes, which have always existed in nature, are popular for the processing of organic MSW, and these will remain favourites with the public because their use avoids burning (incineration). These two are composting, and digestion. The defining difference between composting and digestion, which are both natural microbiological processes is that in composting decomposition takes place in the presence of sufficient free oxygen (air) to maintain the system aerated (aerobic), whereas in digestion there is no free oxygen, and the only oxygen present is in chemical compounds, and in the microorganisms such as the bacteria which are present. All MSW contains both woody materials and “wet” organic material such as grass cuttings. The lignified (“more woody”) wastes have to be composted, wet and easily degradable wastes, and sludges, are suitable for anaerobic digestion. In addition these high moisture content wastes will cause odour problems in composting facilities, unless a very high degree of attention is paid to blending and mixing to ensure that a fibrous freely ventilating and completely aerobic composting (fibrous) material structure is retained throughout. In fact, although expert opinions vary, for more than one third of the total potential organic material digestion is a better solution than composting. In many countries previously heavily dependent on landfill, and embarking on organic waste processing for the first time, it makes good environmental and economic sense to start by building composting facilities. Composting can be by simple windrowing, and the first waste streams treated are usually just those derived from kerbside collection of garden waste, which is readily mixed and composted in most climates. Nevertheless, not only are the markets limited for the compost products produced, the undoubted value of this material is very difficult to realise as a financial return. In addition, there is an increasing realisation that this readily compostible kerbside (source segregated) waste once catered for by the provision of suitable composting facilities, is only a first step on the road to achieving reasonable overall waste minimisation targets. At a point, and probably not too far into the future for many developed nations, the waste industry, politicians, and the public will seek more useable products, and look for benefits in other ways from their waste. These will such as in the production of useable forms of fuels, and the avoidance of greenhouse gas emissions by using organic waste derived fuel as a fossil fuel replacement. This is where the magic of combined composting and digestion plants will be realised. 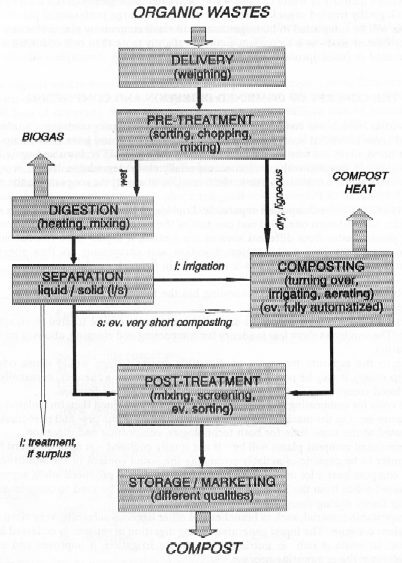 Combined plants, where the digestion is directly integrated with composting, show many advantages, such as the appropriate treatment for different substrate fractions, use of the same machineries for the pre- and the post-treatment, self-sufficiency in energy and net energy production, as well as utilisation of the waste water derived from liquid-solid separation at the end of the digestion for the irrigation of the windrows. The waste heat from generation can be used in built-up areas in “combined heat and power schemes”, in which instead of the low grade heat after generation going to a cooling tower where it is wasted to the atmosphere, this water (which is actually still very hot in terms of house heating use), can be pumped to provide heating for homes, or to warm factories etc. Instead of using all the energy to generate power, much of the biogas may be used as a fuel. The liquid generated during digestion of separately collected MSW and non-hazardous organic industrial waste is rich in nutrients. If used for irrigation on compost, it improves and eventually accelerates the composting process. This liquid is sterilised by the heat of the digestion process and provides an excellent liquid crop fertiliser in the place of chemical fertilisers. Anaerobic digestion readily complies with the precautions necessary to ensure that infections like the Foot and Mouth disease cannot be spread by waste processes. For most organic waste composting with good practise hygiene techniques is sufficient, but for some “animal by-product” (high infection risk wastes) anaerobic digestion provides easy and dependable sanitisation as an inherent component of the process. If digestion plants are located near oil pipelines carbon shift technology can be incorporated for optimum carbon capture, by removing carbon gas (carbon monoxide and carbon dioxide) from the biogas and placing it underground in long-term storage, thus providing the ultimate in the preservation of our planet as we know it. Furthermore, detailed investment and operating costs for aerobic and anaerobic combined process treatment plants are likely to be cheaper than composting alone, when all lifetime benefits are considered. These benefits include carbon emissions reductions (even without carbon capture), and a premium biogas which can be used (after scrubbing and compression) for fuelling motor vehicles. Combined plants cost less over their lifetime than plants which treat the wastes exclusively by way of composting, especially if the increasing willingness of governments to provide operators with financial and tax reduction incentives toward carbon emissions reduction continues, and there is good reason to expect that such incentives will rise dramatically over the next five to ten years. As described earlier, when all things are considered, combined anaerobic digestion and composting can not only be very significantly cheaper than composting alone, but the mass of the residue sent to landfill in the end will also be reduced, and global warming emissions are also minimised. Therefore, the treatment of organic MSW in combined plants is highly recommended, and all those involved in the planning and design of waste treatment facilities should consider these benefits. While it must always be recognised that although combined anaerobic digestion will not always be the best option for all district locations, residents and ratepayers would do well to press their local politicians to ensure that anaerobic digestion is considered carefully by their municipal engineers, before alternative waste treatment technologies are promoted. Download your printer friendly version of this co digestion article here. Major thanks for the post. Anaerobic digestion was a closed book to me before I visited this site. Really looking forward to read more. Awesome. I’ll make sure to bookmark your blog and may come back. Can I let you know that current Queensland Uni. AWMC research is enhancing the understanding of co-digestion risks and drivers for the benefit of municipal and agri-industries. Experiments are being conducted at laboratory-scale to characterise the degradation properties of different wastes under different process conditions and leading to a comprehensive modal and co-digestion manual. Results are being validated at full-scale with the support of industry partners. I added the link in the url box. I always was interested in this subject and still am. So anaerobic co-digestion is simply using more than one different feedstocks so that together they balance each other out, and provide a better methane yield than with just one of the feed materials? Thanks for putting up.